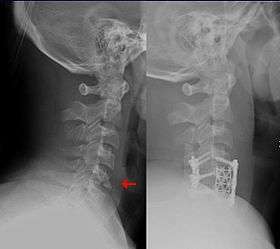 This fracture of the lower cervical vertebrae, known as a "teardrop fracture", is one of the conditions treated by orthopedic surgeons and neurosurgeons. Nicholas Andry coined the word "orthopædics" in French as orthopédie, derived from the Greek words ὀρθός orthos ("correct", "straight") and παιδίον paidion ("child"), when he published Orthopedie (translated as Orthopædia: or the Art of Correcting and Preventing Deformities in Children) in 1741. Though as the name implies it was initially developed with attention to children, the correction of spinal and bony deformities in all stages of life eventually became the cornerstone of orthopedic practice. As with many words derived with the "æ" ligature, simplification to either "ae" or just "e" is common. In the US the majority of college, university and residency programs, and even the American Academy of Orthopaedic Surgeons, still use the spelling with the Latinate digraph ae. Elsewhere, usage is not uniform; in Canada, both spellings are acceptable; orthopaedics usually prevails in the rest of the British Commonwealth, especially in the UK. Originally, the term orthopedics meant the correcting of musculoskeletal deformities in children. Nicolas Andry, a French professor at the University of Paris coined the term in the first textbook written on the subject in 1741. 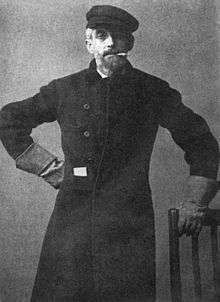 He advocated the use of exercise, manipulation and splinting to treat deformities in children. His book was directed towards parents, and while some topics would be familiar to orthopedists today, it also included 'excessive sweating of the palms' and freckles. ↑ "From Bonesetters to Orthopaedic Surgeons: A History of the Specialty of Orthopaedics" (PDF). Retrieved 2013-12-14. ↑ Irving M (September 1981). "Care of emergencies in the United Kingdom". Br Med J (Clin Res Ed). 283 (6295): 847–9. doi:10.1136/bmj.283.6295.847. PMC 1507078 . PMID 6794724. ↑ Arthur Rocyn Jones. "JONES, Sir ROBERT, Bart". Welsh Biography Online. Retrieved 2010-12-31. ↑ Wroblewski, B.M. (2002). "Professor Sir John Charnley (1911–1982)". Rheumatology. The British Society for Rheumatology via Oxford Journals. 41 (7): 824–825. doi:10.1093/rheumatology/41.7.824. PMID 12096235. Retrieved 2008-04-28. ↑ Hamelynck, K.J. (2006). 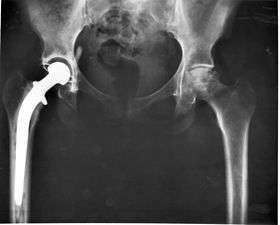 "The history of mobile-bearing total knee replacement systems". Orthopedics. 29 (9 Suppl): S7–12. PMID 17002140. ↑ "AOBOS 2012 Candidate Handbook" (PDF). American Osteopathic Board of Orthopedic Surgery. 2012. Retrieved 19 September 2012. ↑ Weiss AJ; Elixhauser A. (March 2014). "Trends in Operating Room Procedures in U.S. Hospitals, 2001—2011". HCUP Statistical Brief #171. Rockville, MD: Agency for Healthcare Research and Quality. 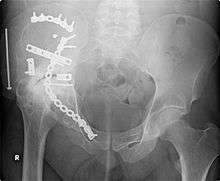 Wikimedia Commons has media related to Orthopedics.